Welcome to Surfers Paradise Bridge Club. Enjoy a game of bridge in a friendly, social atmosphere. The club welcomes newcomers and visitors and offers duplicate sessions six days a week for the experienced players or introductory sessions and supervised sessions for those wanting to learn the game. We are located at 1 Carrara Street, Benowa, 4217. Parking is available -the entrance is a few metres east of Carrara St in Ashmore Road. See Location Google Maps. 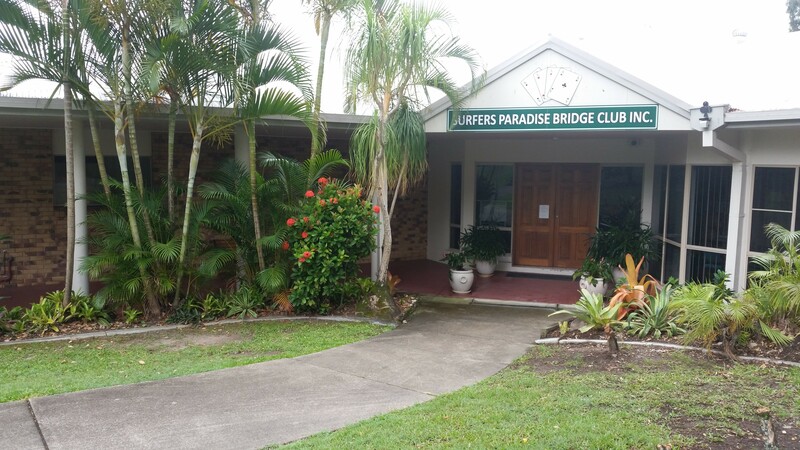 Surfers Paradise Bridge Club is a non profit incorporated club and, with 700 members, is one of the largest in Queensland. Click here for a link to our Photos page. We have duplicate sessions 6 days a week, including separate Restricted sections - see our Sessions page for full details. Members' table fees as low as $9.00 per session. Visitors pay $12.00 a session. Refreshments and tea/coffee included. Graded sections available for less experienced players, and Supervised play sessions are held twice a week. Regular introductory instruction is available.